The 420T-1107-15 Trinocular Stereo Zoom Microscope from National Optical is a versatile stereoscopic microscope, ideal for photographic and video applications at home or in the lab. The included trinocular port adapter allows for simple and convenient connection of this microscope to a camcorder or SLR camera. This trinocular stereoscopic microscope's post mount permits up and down adjustment of viewing head, 55 - 75mm interpupillary range ensures comfortable long-term viewing, and achromatic color corrected lenses provide bright and crisp images throughout the entire zoom range. 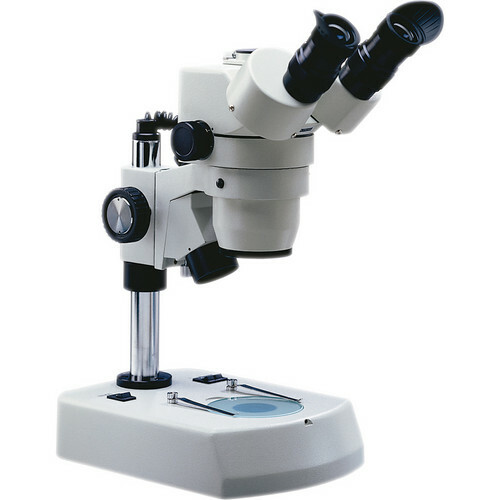 The convenience of viewing a widefield image at 15x magnification, then zooming continuously all the way to close-up detail at 40x magnification makes this stereoscopic microscope ideal for hobbyists and forensic investigators.